Wes' father always told him that there was only one ball in basketball. That you had to know when to take it yourself and when to give it up, that finding the right balance was key. So at every practice and game, Wes tries his best to be a good basketball player and, above all, a good teammate. As the season kicks off, Wes finds that not everyone on his team has the same idea. All-star player and the Hawks' point guard, Danilo "Dinero" Rey seems determined to hold the spotlight and the ball, even if it means costing his team the game. If Wes is to lead the Hawks to the playoffs, he'll need to find new ways to dish out an assist--even if it means his most important one comes off the court. Everybody always says there's only one ball in basketball. Now one had just hit Wes in the side of the face, making him feel like somebody had slapped him. This is deftly handled, and one feels for Wes as he tries to succeed both on the basketball court, as well as dealing with the way his family has been fractured. Lupica's secondary characters are well-rounded (Wes' best friend, Emmanuel, and his mentor, Mr. Correa.) There is also a great rivalry going on with Dinero Rey. Dinero is a bit of a show boat, and has his own issues. Can he be part of a team, with a player like Wes, who is equally as good, or will Dinero give in to ball-hoggery and bring the team down? My 12-year-old is an extraordinary basketball player, and we read this novel aloud together, Here's what he thought: No Slam Dunk doesn't just tell you about what's on the court, it also tells you about what's happening off it. It really makes you see these characters in another way. I like the story and the conflicts and the way they solve it. 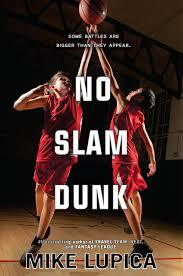 I would give No Slam Dunk a 9 out of 10. Mike Lupica began his newspaper career covering the New York Knicks for the New York Post at age 23. He became the youngest columnist ever at a New York paper with the New York Daily News, which he joined in 1977. 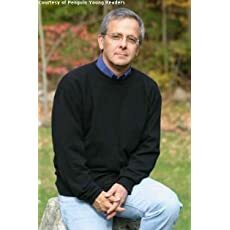 For more than 30 years, Lupica has added magazines, novels, sports biographies, other non-fiction books on sports, as well as television to his professional resume. For the past fifteen years, he has been a TV anchor for ESPN's The Sports Reporters. His previous young adult novels, Travel Team, Heat, Miracle on 49th Street, and Summer Ball, have been New York Times bestsellers. Lupica is also what he describes as a "serial Little League coach," a youth basketball coach, and a soccer coach for his four children, three sons and a daughter. He and his family live in Connecticut. Michele Weber Hurwitz may be one of my favorite middle grade authors. I loved both Calli Be Gold and The Summer I Saved the World... in 65 Days and was honored to do a cover reveal of Ethan Marcus Stands Up. So, when Michele contacted me about reviewing her new book, I jumped at the chance. Siblings Ethan and Erin Marcus may be only eleven months apart in age, but they're a million miles apart in every other way. Ethan's laid-back and doesn't plan beyond his next snack, and Erin's intense, super organized, and super serious. So when these two polar opposites both receive invitations to attend a prestigious tech/maker camp during winter break of seventh grade, complications are bound to happen. Erin's arch rival is attending too, and she's focused on beating him. But when neither of their inventions are working, Ethan and Erin realize the only way to succeed is to team up. Easier said than done. Ethan: As worst days go, the Monday after Thanksgiving break is right up there with the last day of summer vacation. Michele Weber Hurwitz has an unerring ear for how middle schoolers express themselves, and she understands their world view. I loved how she told this story through multiple points of view (and if you are a writer attempting this, I would recommend this as a prime example of how to do this successfully.) Not only does Weber Hurwitz narrate through both laid-back Ethan and his sister, the intensely intense Erin, but she also has chapters in the voice of Ethan's best friend Brian, and Erin's friend, Zoe. Most importantly, we also get a POV from Marlon Romanov, whom Erin can't stand after he beats her in a science competition. In Erin's opinion, Marlon is arrogant and rude. But when we see things through Marlon's eyes, we understand him and feel for him. This could only have succeeded through this narrative strategy. Michele Weber Hurwitz also gets full marks for her depiction of adult characters, and she does a great job of describing setting. As Ethan and Erin attend the tech/maker camp, Weber Hurwitz tantalizingly reveals that things are not what they seem. This novel is full of Michele Weber Hurwitz's warmth, charm, and empathy. Her dialogue is spot-on, and the novel ends satisfyingly. This is a great school and sibling story, and I would wholeheartedly recommend it for readers who love true-to-life stories. Michele Weber Hurwitz is also the author of two middle grade novels; The Summer I Saved the World... in 65 Days and Calli Be Gold. Both have been nominated for several state reading awards. She lives in the Chicago area with her family. You can find more info about Michele on her WEBSITE, which I am a big fan of. Ciao! The Mafioso has to admit straight-up that he counts Paul as a friend--and that Paul was a member of the group blog Project Middle Grade Mayhem, which I managed. This, of course, has made The Don wildly happy. As he was famously quoted by Mario Puzo, "Friendship is everything. Friendship is more than talent. It is more than the government. It is almost the equal of family." And, as he just told me, "You should be doing nuttin' but writing 'bout your friends. 'Cos, when I'm gone, that's all you'se gonna have left. Capice?" I guess that's a strong green light. Natural disasters and a breakdown of civilization have cut off Alaska from the world and destroyed its landscape. Now, as food runs out and the few who remain turn on each other, Travis and his younger sister, Jess, must cross hundreds of miles in search of civilization. The wild lands around them are filled with ravenous animals, desperate survivors pushed to the edge, and people who’ve learned to shoot first and ask questions never. Travis and Jess will make a few friends and a lot of enemies on their terrifying journey across the ruins of today’s world—and they’ll have to fight for what they believe in as they see how far people will go to survive. "With any luck we'll be gone by tomorrow," Dad says. I nod and keep stuffing the tent into its sack, looking forward to getting out of this ash bucket but not to the four hundred mile walk north. And not to cramming my six-foot frame into a small tent with my mom, dad, and sister." Paul Greci lives in Alaska, and seems to have taken the land into his very sinews and bones. As in his debut middle grade, Surviving Bear Island, the setting is a character in itself. Around Fairbanks, the land has been ravaged by fires, and what is left of society is living on the very edge. The characterization is great. Paul deals with a large cast of characters, but the ones who truly matter are made indelible by his deft descriptions. 17-year-old Travis chafes against his father's hard-nosed commands, but comes to an understanding of why his father was the way he was. His ten-year-old sister, Jess, misses her mother deeply, yet Jess shows amazing grit and resolve as she keeps up with the older characters as they make their way through many miles through treacherous terrain. The main antagonist, Dylan, is a truly frightening character because he seems to have some sort of power to read the land and sense what's going on. 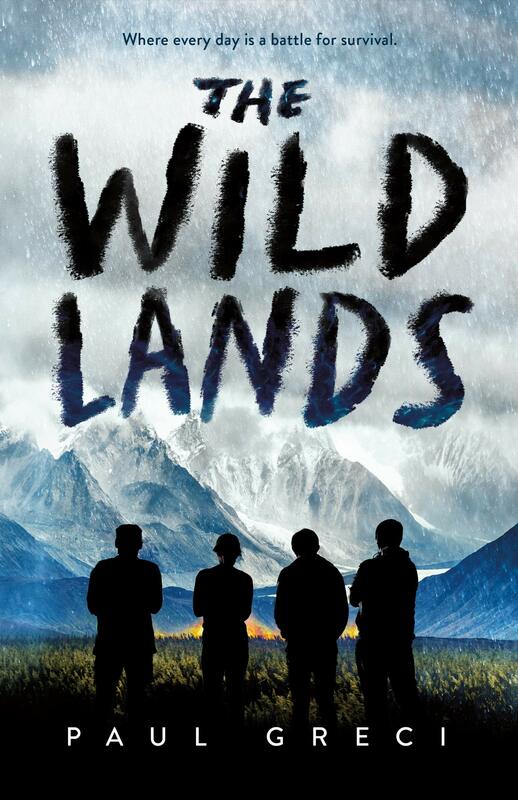 The issues of climate change, environmental destruction, and the collapse of society hang over this masterful YA dystopian novel--but it is never a polemic because the characters are so well-formed and the writing so self-assured. I wholeheartedly recommend this novel to all those who love survival stories, heart-pounding thrillers, and novels set in wild places. MGM: Was there anything in particular that sparked your idea for The Wild Lands? Paul Greci: I spend a lot of time in the Alaska wilderness and love writing wilderness survival stories. I am fascinated both with survival and with climate change, so putting the two together was a story idea that resonated with me. MGM: How long did you work on the novel? Paul Greci: The Wild Lands took about ten months from the first word of the first draft to a final draft where I was offered representation by a couple of agents. When we finally found a publisher a few years later, I did a couple revisions based on the notes I received from my editor. In contrast, Surviving Bear Island, my first novel, went through about 50 revisions over a ten-year period before it was published. MGM: Are you writing a sequel? “A compelling story that wouldn’t let me stop reading. Greci has created both a frightening landscape and characters you believe in and want to survive it.” ― Eric Walters, author of the bestselling Rule of Three series. 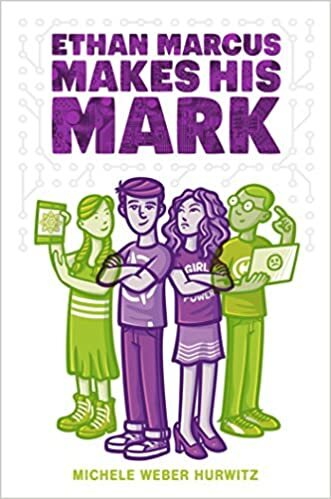 As chance would have it, I'm reviewing this the week after Greg Pattridge featured it on his Always in the Middle blog--which goes to prove that, at least for Marvelous Middle Grade Monday, there is absolutely no collusion. But... The Don was rather miffed I got pipped at the post by Greg. The Don: What's this I hear, Michale? This Greg guy, he runs the show, and he also gets to be the first talking about this friends- going-to-war book? Great title, by the way. What'cha going to do about it? Want me to send in the boys to pay this Greg a little visit? Middle Grade Mafioso: I don't want any trouble, Boss. Greg's a great guy, and he's just a little bit more organized than I am. The Don: Organized? You're part of an organization, ain't ya? This organization. Now, you want out, you just say the word. There's plenty of little fishes in the sea, just sayin'. MGM: No, no, Boss. I'm happy doing your bidding. Now, you wanna hear about this book? I'll read it to you while you eat your antipasto. Look, we've got some cured meats, olives, peperoncini, mushrooms, anchovies, artichoke hearts, various cheeses... That's right, buon appetito! Flying from Chicago to Boston by myself hasn't been as big a deal as my dad said it was going to be. But nothing ever is. The second I turn on my phone, it dings with three texts from him. 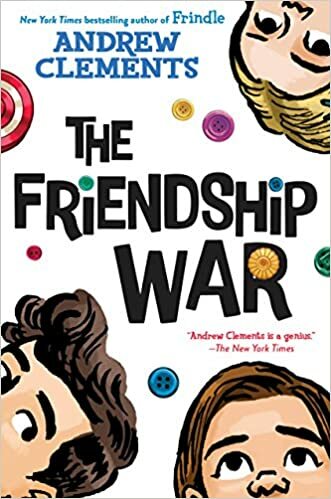 Andrew Clements is a master of the middle grade voice, and he's picked a topic all those of us who live with middle graders are intimately familiar with: the all-consuming fad. Whether it be fidget spinners or Fortnite, something always seems to flood the market and literally everyone seems to be doing it or having one. In this particular story, it's buttons. Grace, the main character, finds a stash of buttons on a visit to her recently widowed grandfather--and it's game-on after that. What brings in the conflict is the fact that Queen Bee Ellie has to get into the action and one-up Grace. This felt realistic, also. At this age, friendship and rivalry can be different sides of the same coin--and who among us hasn't had what the kids these days call a "frenemy?" The novel reads very quickly, the middle grade voice is perfect, and the characters are fleshed out. I liked Grace's sweet relationship with Hank, and the fact that the ending was a lesson in the consequence of making bad decisions. I can't wait to see what Andrew Clements will come up with next! Andrew Clements is the New York Times bestselling author of the beloved modern classic Frindle,which has sold over six million copies, won nineteen state awards (and been nominated for thirty-eight! ), and been translated into more than a dozen languages around the world. Called the “master of school stories” by Kirkus Reviews, Andrew is now the author of over eighty acclaimed books for kids. He lives in Maine with his wife, Becky. They have four grown sons and two rascally cats. Visit Andrew online at andrewclements.com. MGM: Okay, Boss, I see you liked this one too. What shall we read after dinner? I guess we'll all know soon enough. Till then, ciao! This is the third book in the Bowser and Birdie series that my youngest son and I have read, the other two being WOOF and ARF. A bull shark in the swamp? No one in the Louisiana town of St. Roch believes it at first, but when a local boy has a face-to-face encounter with the toothy monster, every big fisherman is called out for the hunt. There's a big cash bounty on the shark. Sharp-eyed Birdie Gaux and her handsome dog Bowser can't help noticing that shark fever is causing some shady doings in town. For instance, where is Snoozy, the clerk who works at the Gaux family fishing store? He's the town's best fisherman, but suddenly he's missing. Is a rival bounty hunter behind Snoozy's suspicious disappearance? Or perhaps the marine biologist who said he'll do anything to keep the shark alive? Birdie and Bowser are determined to find Snoozy and bring him home safe, but the job is more dangerous than they know. Bowser better practice his paddling: He and Birdie are heading for deep waters . . .
A car beeped outside our home at 19 Gentilly Lane. Beep beep. The beep beep of a horn hurts my ears in a way you probably wouldn't understand, since my sense of hearing is a lot better than yours. I didn't say better than yours, so don't be upset. But just between you and me, it is better! I hear sounds humans don't hear all the time! Bowser is a total character, and his narration is often very funny. As the series has progressed I've really come to enjoy Quinn's portrayals of his characters from the idolized-by-Bowser Birdie to Snoozy LaChance (always sleeping on the job) to Grammy with her harrumphs. The sticky, steamy bayou around St. Roch, Louisiana is almost a character by itself. The mystery was slighter plot-wise in this one, but there were several perilous moments. I wonder what my 12-year-old thought...? Honestly, I thought it was kind of boring. (Why?) Because it was one of those books where it took so long. I was expecting a mystery, like in the other ones, but this one didn't really deliver. (Were there any good things about it?) It was funny on occasion. Hmmm, interesting. The oldie liked it better than the target audience... I wonder how often that happens. Well, I better get looking for a book that both of us enjoy. Any suggestions? Spencer Quinn is the pen name for thriller-writer Peter Abrahams. 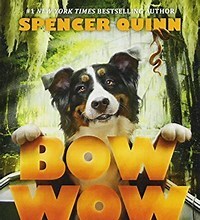 Under the Spencer Quinn name, he writes the Chet and Bernie mysteries for adults, and the Bowser and Birdie series for middle grade readers. A father of four grown-up kids, Abrahams lives on Cape Cod with his wife and two dogs, Audrey and Pearl, whom he calls "the kind of researchers writers dream of, showing up every day and working for treats." 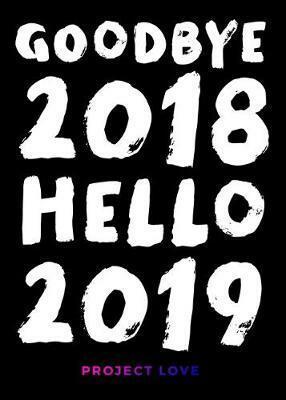 Goodbye 2018... Hello New Year! What, another year gone by?! It doesn't seem possible, but here we are. Writing-wise, the high point of 2018 was taking part in NaNoWriMo for the first time. I've always been a bit of a skeptic about writing a 50,000 word novel in a month--especially a month as hectic as November. But, with the help of a couple of amigos, proving once again that writing is all about camaraderie, I made it to the finish line with a dozen words to spare. What I learned was that I can actually carve out daily writing time. It doesn't hurt that NaNo has an amazing website that offers one all sorts of blandishments: badges for hitting writing milestones, a daily tracker, and the chance of calling oneself a "winner" in the end (and I have the t-shirt to prove it.) The novel I was writing still isn't finished, but I am actually quite happy with it. Writing so speedily unnerved my inner critic--you know, the one who's always searching for the proper word. (The outer critic, The Don, was just happy to see my fingers flying over the keyboard.) Right now, if you asked me if I'd do NaNo again, I'd give a resounding "YES!" I'm not a big one for 'resolutions,' but I am aware of how meager my blogging has been this year. Not only did Project Mayhem shut its doors, but I found that reading middle grade and writing about it on anything close to a schedule proved difficult. I'm not sure if it's age, or just the general climate. So many blogs have come and gone, and there's much less energy than there used to be. However, I pledge to do a better job on Middle Grade Mafioso--as well as a better job visiting other blogs. If we're all still here, we must be doing something right. Right? Wishing all of you a very Happy New Year--the last year of the Teens! May 2019 be creative and courageous for us all. 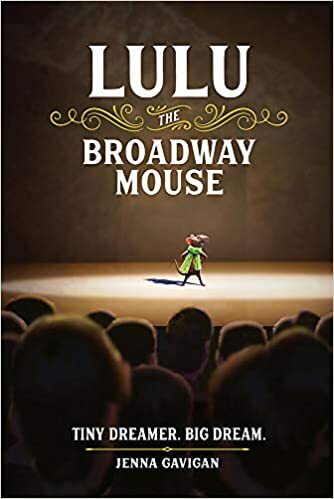 Lulu is a little girl with a very big dream: she wants to be on Broadway. She wants it more than anything in the world. As it happens, she lives in Broadway's Shubert Theatre; so achieving her dream shouldn't be too tricky, right? Wrong. Because the thing about Lulu? She's a little girl mouse. When a human girl named Jayne joins the cast of the show at the Shubert as an understudy, Lulu becomes Jayne's guide through the world of her theatre and its wonderfully kooky cast and crew. Together, Jayne and Lulu learn that sometimes dreams turn out differently than we imagined; sometimes they come with terms and conditions (aka the company mean girl, Amanda). But sometimes, just when we've given up all hope, bigger and better dreams than we'd ever thought could come true, do. But, you say, the narrator's a mouse! Look, kids, I used to not be a fan of animal narrators--but the more middle grade I read, the more accepting I get. The cool thing is that the stars of the Broadway stage are so accepting of "Tiny" and her Broadway dreams. Lulu's family lives in the Shubert Theater (a Broadway theater in real life) and Lulu is stage-struck. I love all the allusions to Broadway shows she weaves into her narration, as well as the insights into putting on a show. The story ends on a high note (no spoilers here!) I would whole-heartedly recommend this to each and every kid who loves to perform--as well as those readers who embrace animal stories. I unequivocally LOVED it. Jenna Gavigan, a fourth generation New Yorker, grew up dreaming of Broadway. At age sixteen she made her Broadway debut in Gypsy, opposite Bernadette Peters. Since then she's appeared in a half-dozen films, on more than a dozen television shows, and on east and west coast stages, most recently Off-Broadway in the world premiere of Straight. Jenna graduated from Columbia University with a BA in Creative Writing, where she focused on fiction, television, and screenwriting. She lives in a teeny tiny Manhattan apartment with her husband, Kevin. This is her first novel. Find Jenna online at IamJennaGavigan.com and on Twitter and Instagram @Jenna_Gavigan.